RhiReading: Weekend Reading [05/09-05/11] :: Nerd Makeup, Cleaning to Read, & a GIVEAWAY! Weekend Reading [05/09-05/11] :: Nerd Makeup, Cleaning to Read, & a GIVEAWAY! Happy Friday dear readers. How do you like my wee bunny? Isn't it cute? 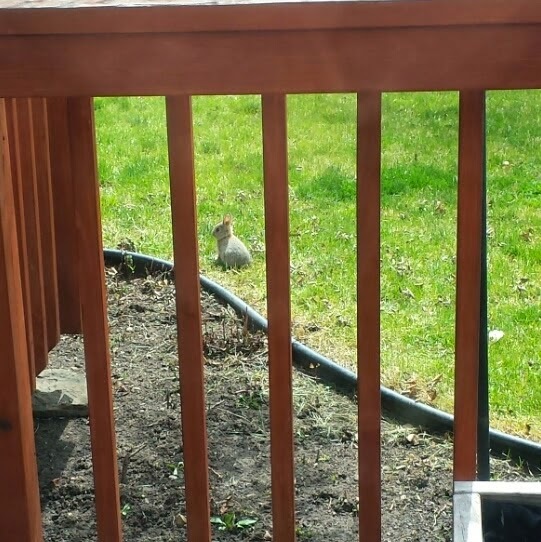 Last weekend we discovered that the rabbit that has been living under our deck all winter was there to spawn her seedling destroying minions. Alas, it looks like this one—whom I have dubbed the name Oscar—was the only one that survived. (I'm trying not to think about the fact that there might be dead baby bunnies under my deck, most mommy bunnies eat their dead babies). Spring is finally starting to happen here on the high plains so we have had some really nice sunny days but also hail. I happened to be out of town for part of Sunday and missed the quarter sized hail that pelted this part of the state. As we drove back it was weird to see it. It looked like it has blizzarded with drifts of hail up against houses and such. Here's hoping we get more sun and less crappy snow and hail. Yes, it snowed a bit this week too. Nothing unusual for us. 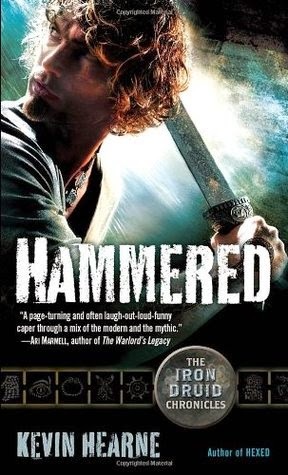 I've been rocking away at Spring Cleaning projects as I listen to HAMMERED by Kevin Hearne. I'll admit it... with the way the series kicked off with back-to-back releases I couldn't get my hands on ARCs and so I am that behind on the series even though I lovelovelove it! Definitely a good choice to get on audio, I have to say I wasn't sure I really wanted to bother with it since they're not that long but well worth the money spent. I've done lots of cleaning thanks to wanting to 'read' it. ;) If you haven't read this series yet you are missing out on some of the funniest stuff I have read. The next few weeks are going to be pretty packed if all the tour invites I got this week have anything to say about it. I'm a little behind on reviewing but have been reading a ton. I actually slipped in 2 non-fiction reads this week (thanks NetGalley for always being a good spot to help me cleanse my reading palate) too. But my focus has primarily still been the Dark and Deadly boxed set. It's just so huge. Eight books doesn't sound like many when you buy a boxed set but yeesh... it has been a bit overwhelming. What book or books are you trying to read right now? I'm not sure what my weekend plans are beyond cleaning and trying to write a couple of reviews. I might do a TV binge tomorrow if I get the chance. Otherwise it's reading DARE TO RESIST by Laura Kaye and whatever other reading I need done by Monday. lol My brain is extra mushy today. Don't mind me. 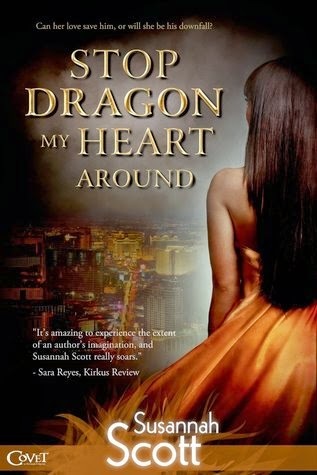 Since I have a Kindle copy of STOP DRAGON MY HEART AROUND I want to give away this weekend just leave a comment by Monday morning (10AM MST) telling me what you're reading and be sure you follow me via something... GFC, Facebook, Twitter... you pick one (or all!)... and leave a way to contact you if you win of course. I'll random.org a winner on Monday from the commenters. Even my mom loved this book. She called to gush about it and beg me for insider info which I was pleased to get to dish about. Being a street teamer means keeping secrets but also, having extra insight into what the author has planned for a series. It stands alone well too so if you haven't read LUCK OF THE DRAGON don't worry, you can go back to it later. 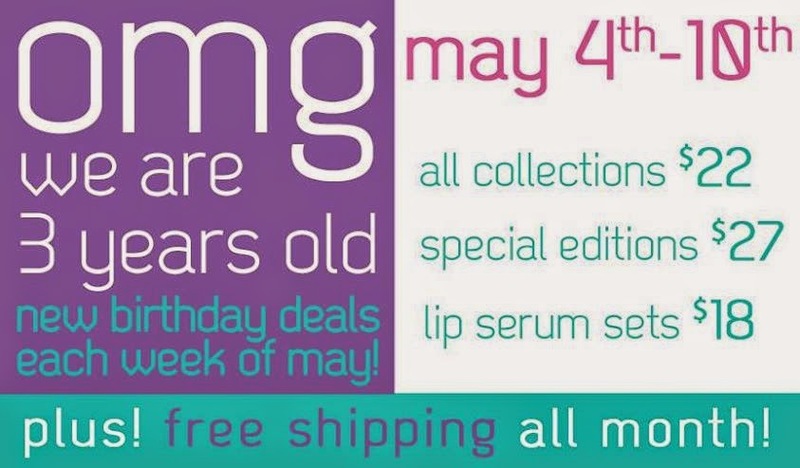 With Mother's Day this weekend... yeah, the only thing I really want aside from stuff I really can't afford right now is to grab a couple of things from Espionage Cosmetics. You guys are going to keep seeing me mention them because they're friends of my friend and I love what they're doing. Nerd makeup has always been something I wanted to come up with but am way too lazy to research and pull off so they are rocking it. I'm trying to decide which collection to get because I really can only afford one. Which would you choose: Paranormal or Ice & Fire? Speaking of EC, they are celebrating their 3rd birthday this month!